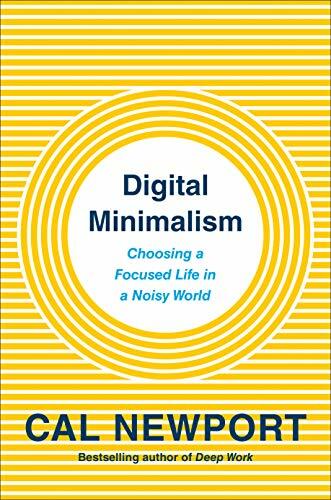 This post contains my carefully crafted summary of Cal Newport’s new book titled Digital Minimalism, choosing a focused life in a noisy world. If you’re interested in my review see my previous post. Modern digital life is exhausting. The urge to check Twitter or refresh Reddit becomes a nervous twitch that shatters uninterrupted time into shards too small to support the presence necessary for an intentional life. There’s a collection of distressing concerns: addiction, reduction in autonomy, decrease in overall happiness, incentive to stoke darker instincts, and distraction from more valuable activities. The author has become convinced that what you need instead is a full-fledged philosophy of technology use, rooted in your deep values, that provides clear answers to the questions of what tools you should use and how you should use them and, equally important, enables you to confidently ignore everything else. He calls it digital minimalism, and it applies the belief that less can be more to our relationship with digital tools. New technologies such as social media and smartphones massively changed how we live in the 21st century in unexpected and unplanned ways. Individual use cases for social media might sound positive but they have expanded beyond the minor role we adopted them for, causing the general unease of losing control to attention economy conglomerates. Facebook causes profitable behavioral addictions that makes it very difficult to resist checking your account over and over again. The addiction properties aren’t accidents, but carefully engineered design features to absorb as much as your time and conscious attention as possible through intermittent positive reinforcement and drive for social approval. Regular doses of solitude, defined as freedom from input from other minds, brings insight and emotional balance that comes from unhurried self-reflection, but it’s at risk of fading away for the first time in human history caused by the spread of anxiety inducing modern internet-connected smartphones. Leave your phone at home since it’s the primary enabler of solitude deprivation. Take long walks alone, preferably without your phone. Write letters to yourself when encountering a complicated decision, or a hard emotion, or a surge of inspiration. Connection is low-bandwidth online interactions like social media, text, or instant messaging while conversation is richer high-bandwidth communication in real-world encounters between humans like a face-to-face meeting, video chat, or phone call–involving nuanced analog cues such as the tone of your voice or facial expressions that our brains evolved to crave. Many connections don’t equal a conversation, a balance must be found through a philosophy the author calls conversation-centric communication that argues conversation is the only form of interaction that “counts” toward maintaining a relationship. Things like only clicking “Like” buttons or commenting teach your mind that connection is a reasonable alternative to conversation. For your social well-being, adopt a baseline rule you’ll no longer use social media as a tool for low-quality relationship nudges. Leave your phone in “Do Not Disturb” mode on a schedule to consolidate texting. Hold conversation office hours, putting aside set times on days your always available. Doing nothing is overrated, cultivate high-quality leisure to replace low-value digital distractions and avoid falling back into old habits. Schedule low-quality leisure in advance. Join groups like sporting league, committee at temple, volunteer, PTA, social fitness, D&D—anything to replicate benefits of connecting with fellow citizens. Follow a seasonal (trimesters or quarters) plan stating objectives and habits then use a weekly leisure plan for more specific scheduling. “Attention economy” describes the business sector that makes money gathering consumers’ attention and then repackaging and selling it to advertisers. Most people only need 20-30 minutes a week to keep up with important Facebook activities, yet the average user spends 350 minutes per week. If everyone started thinking about their use in similar utilitarian terms, the amount of eyeball minutes Facebook has available to sell to advertisers would drop by more than an order of magnitude, creating a massive hit to their bottom line. The author’s research on digital minimalism has revealed the existence of a loosely organized attention resistance movement, made up of individuals who combine high-tech tools with disciplined operating procedures to conduct surgical strikes on popular attention economy services—dropping in to extract value, and then slipping away before the attention traps set by these companies can spring shut. Delete social media from your phone to avoid accessing them on the go, you don’t need to quit social media completely. Turn your devices into single-purpose computers in any given moment while preserving their long term general purposefulness. Use social media like a professional to cut through the noise. Facebook is only close friends and relatives, focus on high-quality thinkers or influences in a topic area, use advanced filtering. Digital minimalists see new technologies as tools to be used to support things they deeply value—not as sources of value themselves. They don’t accept the idea that offering some small benefit is justification for allowing an attention-gobbling service into their lives, and are instead interested in applying new technology in highly selective and intentional ways that yield big wins. Just as important: they’re comfortable missing out on everything else. Digital minimalism is much more than a set of rules, it’s about cultivating a life worth living in our current age of alluring devices.